SADNESS CAN SAVE US. In a society obsessed with happiness (this topic is well worth several blog entries by itself), we expend a great amount of energy minimizing or altogether avoiding negative emotions, namely sadness. I once heard sadness described as a bridge that will always take us to a new, better place, if we’re willing to sit with it. This idea often goes against the grain for us. Sadness is uncomfortable, sometimes unbearable. 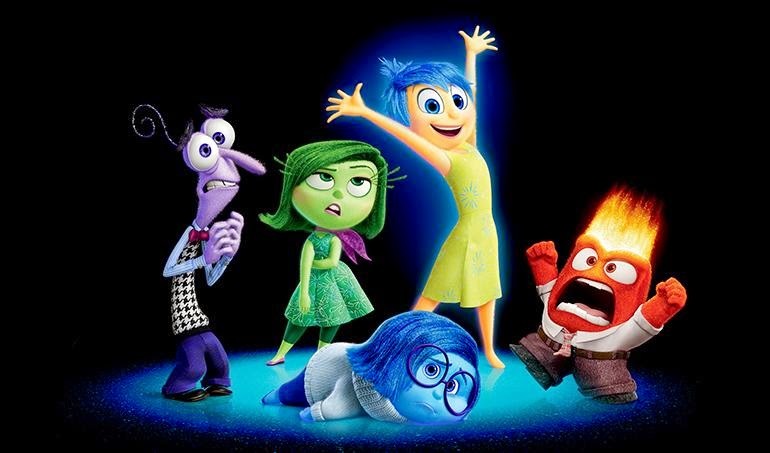 But sadness (and other “negative” emotions) is crucial to our development and our humanity, as this film makes clear. It’s not just a lesson for parents and kids, or a tool for therapists to use in session, though it certainly is both of those things. In our happiness-obsessed culture, Pixar gives us a precious reminder that all of our emotions are gifts, and that ultimately, they can serve to bring us together. MEMORIES ARE NOT NECESSARILY ACCURATE, AND CAN CHANGE, DEPENDING ON CONTEXT. One of the most creative parts of the film is its depiction of memory networks. Yes, it requires some suspension of disbelief (this isn’t a documentary, after all), but overall, the main points are right on target, and are depicted in a wonderfully creative and entertaining way: Short-term memories are stored in emotion-infused, glowing orbs, which in turn are converted (during sleep) to either long-term memories stored in a seemingly endless library-like labyrinth, pushed down deep in the bowels of the subconscious, or dumped into the abyss of the forgotten. Recalling a memory can change it. Depending on what one is feeling at the time, or the “reality distortion filter” that one has in place, the memories themselves can carry different emotions, and impact our thoughts and behaviors in different ways. COULD PIXAR BE RESPONSIBLE FOR INSPIRING A WHOLE NEW GENERATION OF NEUROSCIENTISTS? I can’t say enough about Pixar’s creativity, specifically regarding the design of the mind’s landscape, or the “inside” of Inside Out. Similar to a massive amusement park built in space, what kid (or adult, for that matter) wouldn’t want that for a playground? The off-limits Abstract Thought Chamber is both hilarious and developmentally on target, and dreams are produced in the Dream Productions Movie Studio, fully stocked with elaborate sets, costumes, crew and cast members, including a diva rainbow unicorn. Films can and do inspire future passions, even careers, and my personal hope is that this film will not only entertain and educate adults, but that it will open doors to young people’s imaginations, and spark a lifelong fascination with the inner workings of our minds and what it means to be human. INSIDE OUT IS AN EMPATHY MACHINE. As Pixar teaches us lessons about the importance of both joy and sadness (and all the rest), they dose out large samples of both throughout the film. Yes, the storyline is about a tween girl whose family relocates from Minnesota to California, but as I was following along with Riley’s story, I found myself recalling events from my own childhood, feeling a certain amount of loss for the events that seemed further away from me, and wondering which important memories (“core memories,” according to the film) have helped to shape who I am and how I perceive the world. The late movie critic Roger Ebert described movies as “the most powerful empathy machine in all the arts,” and this film effectively illustrates that concept. Co-writer and director Pete Docter has stated that part of the reason he wrote Inside Out was to help him understand his own daughter as she went through the emotional changes of the tween years. What Docter and Pixar have created is a beautiful film both universal in scope and personal in the ways it touches us. Though marketed as a kids’ movie, don’t be fooled: it’s for all of us. If you feel that you need additional tips regarding parenting and children, you contact us to make a counseling appointment or read more about child counseling and family and parenting counseling on our dedicated pages. If you liked this post, you can also read 5 Things to Discuss with Kids from Inside Out.